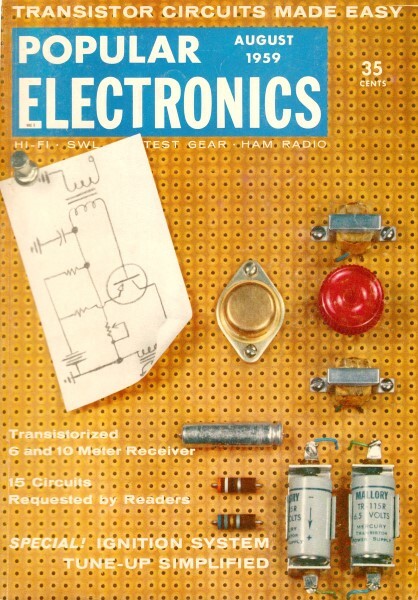 Author Saunder Harris wrote in this 1959 of edition Popular Electronics that the concept of atoms has been around for more than 2,500 years since Greek philosopher Democritus suggested that a particle existed which was basic to all matter. It has only been in the last century and a half that we have learned that even the atom itself is made up of even more basic particles - the electron, proton, and neutron (J.J. Thompson found the electron in 1897, which was postulated by G. Johnstone Stoney in 1947). It wasn't until the 1930s that even those three entities were thought to be constructed of yet more fundamental particles - quarks, bosons, and leptons. Modern science believes it has fully defined the set of subatomic particles, particularly with the Higgs boson having been finally seen in the Large Hadron Collider (well, maybe). Does anyone really believe this is the final word on fundamental particles after having been proved wrong so many times? Atomic cloud chamber "footprints" have shed new light on the inner world of the atom. Believe it or not, our Atomic Age is over 2500 years old. It all started back with the ancient Greek philosophers. One in particular, named Democritus, suggested that a particle existed which was basic to all matter. This particle, he said, was invisible and could not be divided. The Greeks had a name for it ... they called it the atom. Early Atomics. This idea of a basic particle or substance was more hunch than scientific theory, and it took thousands of years before it could be put to test. Our present concept of the atom began with the work of John Dalton, an English chemist, who first described the laws of chemical compounds and elements in 1802. He separated matter down to its basic building blocks, the elements. To visualize Dalton's discoveries, imagine that we have a basket of mixed citrus fruit. The complete basket with all the various fruits would be comparable to a chemical compound. If we took out the fruits and separated them into groups of lemons, oranges, grapefruit and so on, we would be breaking the compound down into its elements. Then, if we set apart one orange, for example, we would be isolating a single atom. The next step would be to peel the orange and take a bite of the fruit within. In the case of the atom, this first bite was taken by the English physicist, Sir Joseph J. Thomson, in 1897. Fig. 1. Thomson was able to calculate the ratio of the electron's charge to its mass by bending the electron beam with known electrostatic and magnetic fields. Fig. 2. Cloud chambers such as the one above at the Brookhaven National Laboratory provide clues for atomic detectives. The device bombards atomic nuclei with billion-volt nuclear particles. Atomic fragments leave a path in the moist, gas-filled air which can be photographed and interpreted. 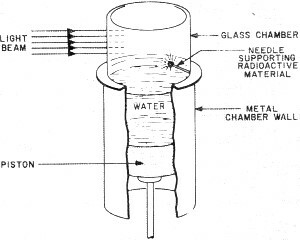 Diagram shows basic construction of cloud chamber. Cosmotron at the Brookhaven National Laboratory accelerates particles to energies of two or three billion volts. Inside diameter of the Cosmotron is over 60 feet. Fig. 3. Bohr's model of the hydrogen atom. Solid line indicates normal orbit of the planetary electron. When electron moves to inner orbit, energy in the form of light is given off. When energy in the form of heat is applied, the electron wll move to the outer orbits. Discovering the Electron. During the middle years of the 19th century, scientists had discovered that if an electric current were passed between two electrodes placed at the ends of a partially evacuated glass tube, a visible beam of unknown nature would travel from negative to positive electrode. 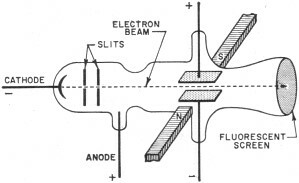 Experiments indicated that this beam was negative in its electrical charge. 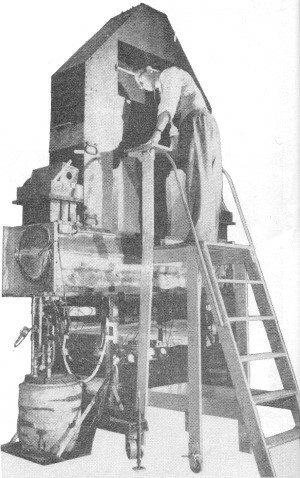 Sir J. J. Thomson, using the apparatus shown in Fig. 1, was able to compute the ratio of the charge of a single particle in the beam to its mass. In so doing he proved that the beam was composed of individual, negatively charged particles. This was the discovery of the electron. In other experiments, Thomson tried using various gases in the tube, but in each case his results were the same. The particle was independent of the material from which it came. Thomson therefore concluded that the electron was a basic constituent of all atoms. You can see that Thomson's apparatus was similar to our cathode-ray tube. In fact, the picture tube in your TV set is a direct descendant of the one Thomson used. If you take a strong magnet and place it against the face of the tube while the set is on, you will see a distortion caused by the magnetic field bending the tube's negative electron beam. This is essentially the same effect that led Thomson to identify the electron. The Proton. 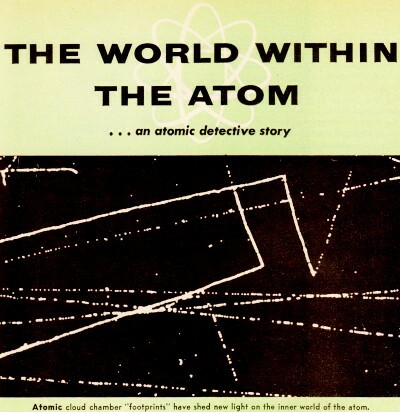 The discovery of the electron was only the first step in the exploration of the inner world of the atom. Since the atom was known to be electrically neutral, the physicist now began to search for the positive particles which would balance out the negative charge of the electron. In 1914, another English physicist, Sir Ernest Rutherford, found such a positive particle and called it the proton. The electron's charge was assigned a value of -1 and the proton's charge a value of +1. Besides the difference in charge, it was also discovered that the proton was much greater in mass than the electron. It was, in fact, 1836 times the mass of its smaller opposite. Obviously, a proton is too small to be seen directly, and you may wonder how it was detected. Consider a trail left in the sky by a jet plane traveling at high speed. By looking at such a trail you can follow the flight of the jet without actually seeing the plane. On a smaller scale, this is how atomic particles are observed. 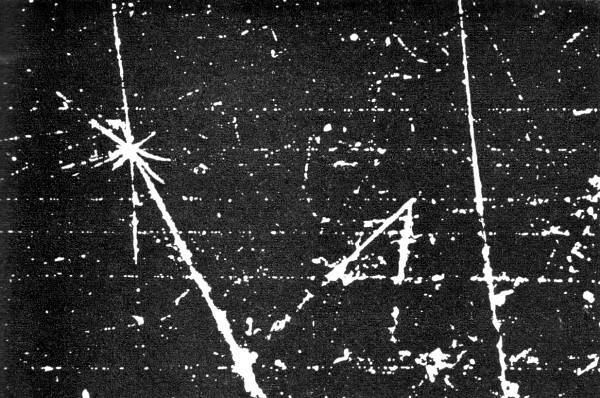 Figure 2 shows a cloud chamber, a major tool in the detection of atomic particles. As high-speed particles pass through the cloud chamber, they produce ions in the chamber's gas-filled atmosphere. When the piston in the bottom of the cloud chamber is suddenly lowered, this gas, which is saturated with water vapor, expands and drops in temperature. Water vapor condenses on the ions and outlines the path of atomic particles through the gas. Photographs can be made of the ion tracks, and by studying photos of the trails, physicists are able to identify the mass and charge of the various particles. Bohr's Atomic Model. In physics, when a theory is proposed, the known facts are often organized by fitting them into a model. Based on this model, observations are explained and predictions are made. Our present understanding of the atom has come about in such a manner. The first proposed model of the atom suggested that it was spherical, like a golf ball, and that its mass consisted of protons with rings of electrons between them. This model, however, did not explain certain phenomena such as atoms giving off light when excited electrically or by heat. It remained for a Danish physicist, Niels Bohr, to offer a model which would explain these phenomena. 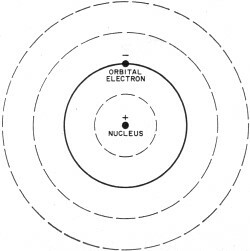 Bohr's conception of the simplest atom, the hydrogen atom, consisted of a positively charged nucleus with a "planetary" electron in orbit around it. To move around the nucleus, the electron had to be influenced by some force. This force, Bohr said, was the electrostatic attraction of the positive proton nucleus for the outer electron. Figure 3 shows a model of the Bohr atom. Bohr was able to explain with mathematics many of the experimental results which were obtained through the use of his model. Isotopes. In 1932 a new particle was unexpectedly discovered. While experimenting with radioactive polonium, German scientists detected a strong, penetrating radiation. In France, the Curies noticed that the placing of a substance containing hydrogen in the path of this radiation caused the release of high energy protons. 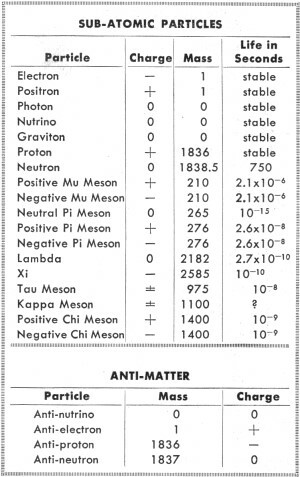 These results were analyzed in the laboratory of James Chadwick, an English physicist, and it was determined that the radiation was a new type of particle which had no charge. This third particle was called the neutron. The fact that various atoms of the same element had been found to have different weights could now be explained by the difference in the number of neutrons in their nuclei. For example, there are three types of hydrogen. H1 has a nucleus which contains one proton. H2 has a proton and a neutron in the nucleus. The heaviest, H3, so rare that only three pounds of it are thought to exist on earth, has one proton and two neutrons in the nucleus. Atoms with an "excess" of neutrons are called isotopes. Isotopes can appear in all elements. The important thing to remember is that planetary electrons in the outer orbits balance the number of protons in the nucleus. Energy and Radioactivity. With our three particles, the electron, the proton, and the neutron, we could set up a mechanical model of the atom such as Bohr's. This model would account for most of the things physicists have observed. What it would not do is explain how mass could be converted into energy (and energy into mass) without loss. In other words, the fly in the atomic ointment would be Einstein's famous equation E = MC2 (energy = mass times speed of light squared). According to Einstein, it is possible to change these two, mass and energy, into each other without a loss. The three-particle model of the atom could not mathematically explain how this is possible. Physicists were thus forced to the realization that there was more to the atom than the electron, the proton, and the neutron. The first inkling that there was energy in the atom came about through the studies of Curie and Becquerel in the field of radio-activity. Three different types of radiation were found to be given off by naturally radioactive radium and uranium: alpha, beta and gamma rays. The alpha and beta rays were high-speed particles while the gamma rays were found to be powerful streams of energy with 100 times the penetrating power of beta particles. Investigating these radiations in the light of Einstein's equation, physicists found that the energy given off did not balance with the loss of mass. In order for everything to balance, the Italian physicist, Enrico Fermi, suggested still another particle. This he called the neutrino or "little neutral one." Fermi theorized that the neutrino would have to be almost pure energy to make the scales balance. It would also be very difficult to detect because of its high speed and lack of charge and mass. It was finally found in 1956 through delicate atomic detective work, a major scientific triumph. Atom Smashers. When the big "atom smashers" were built. scientists were given the necessary tools for probing the inner atom. There are many types of atom smashers, or particle accelerators, their scientific name. Among them are the cyclotron, the betatron, and the cosmotron. Without going into detail on their operation, it is enough to understand that the atom smashers whirl ions of gas around in circular paths by electrical and magnetic means. These ions increase in velocity until they approach the speed of light. They are then deflected magnetically into an opening where they bombard the nuclei of substances under study. If you have ever whirled a stone on a string and had the string break, you will understand the principle of an atom smasher. With the aid of these giant scientific instruments, some of them filling huge buildings, more new particles were discovered. Many of these had been mathematically predicted - and now they were revealed. A particle was found which was the same as the electron, but opposite in charge: it was called a positron or positive electron. 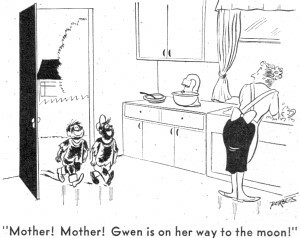 Then in the 1950's an important announcement ... the discovery of anti-matter. Anti-Matter. The French physicist, Dirac, mathematically concluded that each of the basic particles should have an opposite, or anti-particle. Four such anti-particles were found. Anti-matter proved very difficult to detect because of its short life; the anti-matter particles combine with their opposites and annihilate each other almost instantly. Gamma rays equal to their former mass are given off. It is thought that anti-matter differs from its opposite only in that its magnetic poles are reversed, with each particle being considered a small magnet. Mesons and Hyperons. Next, two other particles were found: the meson, whose existence was predicted by the Japanese physicist, Yukawa, and the hyperon, the most massive of all atomic particles. These are each actually families of particles, rather than single units. Mesons and hyperons are believed to" act as a "glue" which binds the particles of the nucleus together. Where do we go from here? Our 2500- year search for an understanding of matter is far from being finished. There is still no final model of the atom. Man has yet to find the. complete answer to nature's atomic puzzle.